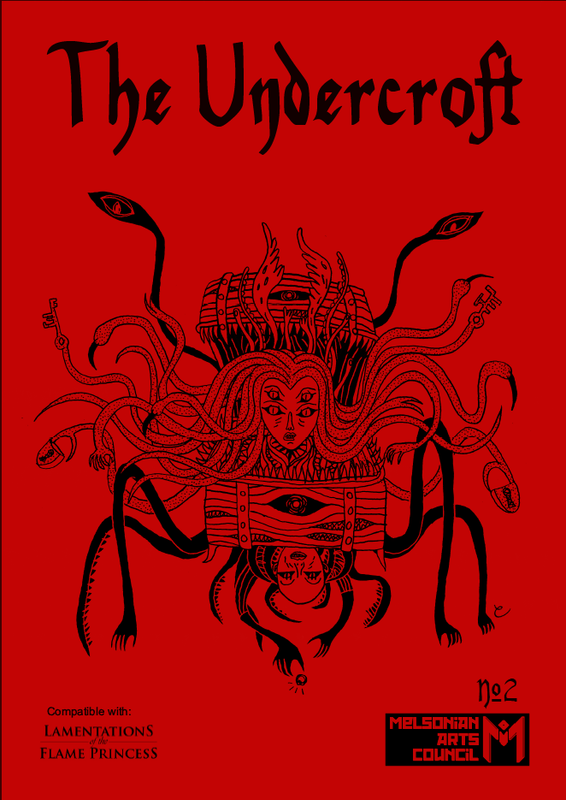 Published by the Melsonian Arts Council—also the publisher of he recently released Something Stinks in Stilton—in July, 2014, issue #1 of The Undercroft was an engaging initial issue, full of intriguing and useful material. It was followed in September, 2014 with issue #2 and as with all second efforts, especially after successful first efforts, the problem of the ‘second difficult album’ has to be addressed. Essentially can the editor and authors maintain the consistency and interest achieved by issue #1? It is even a concern raised by the editor in the opening sentences of the issue’s editorial, but it is clear that the editor is not only unconcerned by the problem, he is proud of The Undercroft #2. That is of course, his prerogative, but the truth of the matter is that The Undercroft #2 is a ‘second difficult album’, or rather a ‘second difficult fanzine’. It opens well enough with Simon Forster’s ‘Between the Cracks’, a nasty little dungeon in which the adventurers explore the laboratory-home of a wizard-alchemist said to live beneath a pool of water. Of course he has not been seen in many years and is said to possessed a valuable treasure. What does lie below is not necessarily treasure, but a horrible monster—a little in the vein of a Hound of Tindalos—waiting for some fool of an adventurer to release it. This is all a bit of a cliché, but no less fun for it. The scenario could have done with giving a motive or two beyond the simple suggestion that the wizard’s laboratory-home be of interest to tomb robbers, but any competent GM should be devise motivations suitable for his campaign and player characters. The simplicity of ‘Between the Cracks’ means that it can easily be added to any wilderness adventure or sandbox. The other monsters presented in The Undercroft #2 are not quite as interesting. In ‘The Pit of Flesh: A Bestiary’, editor Daniel Sell offers the reader the ‘Transplasmic Organic Bifurious Inductors’ and ‘The Visitor’. The former is a ram-horned, porcine-featured ape-like creature created by wizards to turn magical pollutants into slurry that has since been put use dealing with all sorts of waste, from cutting the grass to chomping down on unwanted biological masses… The latter plays the part of the ancient relative, old and sad, insinuating itself into families and feeding on their warmth and their joy, whilst slowing coming to control the members one by one. Of the two, the ‘Transplasmic Organic Bifurious Inductors’ are simply silly, but ‘The Visitor’ has the potential to be quite creepy. 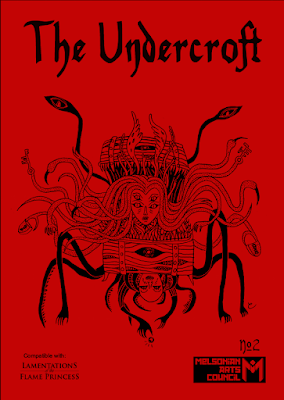 Two or three monsters would seem to be sufficient in a twenty-four page fanzine, but The Undercroft #2 offers yet more. Matthew Adams, best known for his illustrations for the supplement, Yoon-Suin: The Purple Land, draws and describes in turn ‘The Storkman’, ‘The Briar Witch’, and ‘The Snailing’. The first swaps newborn babies for reasons unknown, the second haunts ruins covered in briars, and the third are former misers turned snail-like demons that obsessively hunt and collect certain objects. All three are accorded a full page illustration and barely half a page of text without any stats. What this means is that none of them amount to very much, not helped by either the swathes of empty page or Adams’ scratchy art style which does not really work as full page pieces. Further none of them with stats, so they are not immediately useful. Given how much space they take up—one quarter of the issue—all three entries feel like page fillers. Which is odd given how much little space each takes up on their respective pages. Fortunately, Tony A. Thompson offers up something with a little more substantial in the form of ‘Piteous Potions’. This details a dozen potions of weirder sort—ones that cause the imbiber’s toes to fall and be replaced by hooves, to become disorientated, make a vow of poverty, and so on. All twelve are weird and wonderful and should put the player characters off trying any potions they find for quite a long time. Lastly, the issue is rounded out with Simon Forster’s ‘Blood’, a sanguine piece of horror fiction that just is. Physically, The Undercroft #2 is generally well presented, but this is not the problem with the issue. The problem is that too many—in fact, more than half—of its pages are devoted to uninteresting material, primarily, too many monsters. This is not to say that any of the articles in The Undercroft #2 should not have seen print, but rather they should never have seen print all together in the one issue. The result is that a decent scenario and an interesting monster and some potions are drowned in the underwhelming rest of the issue. Ultimately, a poor choice of material and dearth of interesting ideas after the promise of The Undercroft #1 explains why The Undercroft #2 is a difficult second issue.